Dennis Leary, or as he calls himself the “current” Dennis Leary, is the third of his name to farm pears along the banks of the Sacramento Delta. Growing up, he always knew he’d become a pear farmer. As his parents’ oldest son, he was expected to take part in the family business, and luckily for Dennis, this was a business he enjoyed. 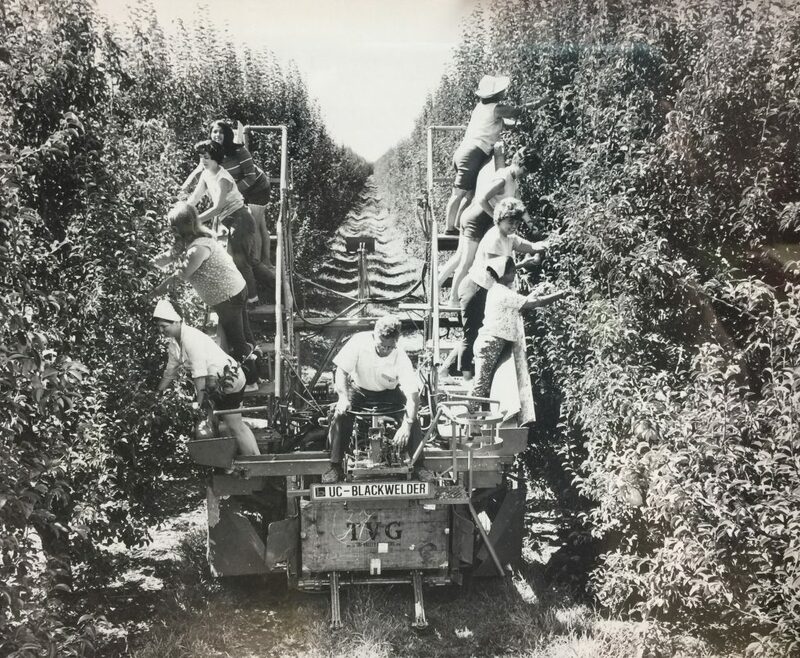 The Leary farming venture was started by Dennis’ grandfather the first Dennis Leary (1849-1926) who was born in Ireland and brought over to America as an infant during the Irish Potato Famine. He was raised near Lincroft, New Jersey. In his teens, he joined the Union Navy and arrived by ship to California just as the Civil War ended. He found employment on a snag boat in the Sacramento Delta and worked on ranches in the area until he saved enough money to purchase a small piece of his own land to farm. By the end of his life, he owned over 600 acres farming mostly open land with asparagus and dried beans as his prefered crops. He also tried his hand at farming pears. He planted 40 acres of pear trees right around the time the first pear blight was developing into a problem. After returning from a trip to Fresno where blight had grown out of control, he removed the two-year old orchard. The second Dennis was Dennis W. Leary (1897-1989) who took over his father’s property in 1926. By this time he had established several pear plantings which are still being farmed today. The second Dennis Leary’s farming interest was almost entirely about developing the pear orchard. 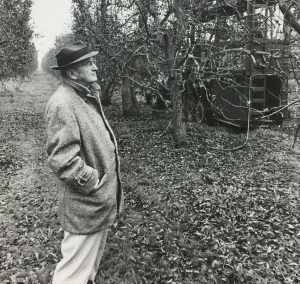 He is known to have said, “If you take care of your pear trees, they’ll last forever.” He implemented one of the first underground spray systems, had his own packing facility, tried mechanically hedging and topping and worked with the use of motorized picking and pruning platforms in the pear orchards. The third and current Dennis Leary was born in 1930. 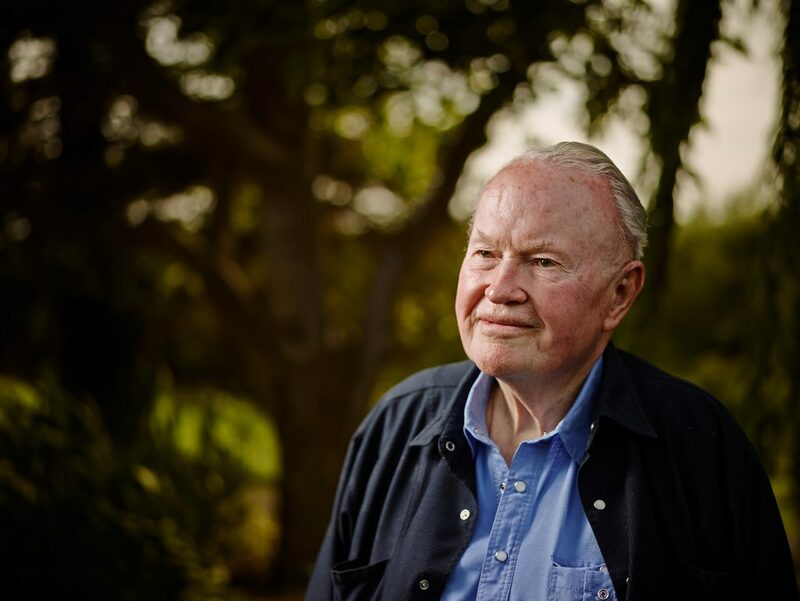 Before joining the family business, Dennis studied horticulture and agriculture at UC Davis until his junior year when he left to serve in the Air Force during the Korean War in 1950. When he got out of the Air Force in 1954 he officially joined the family business. His younger brother Michael joined the operation in 1969 and the two were partners until the property was leased in 1994. 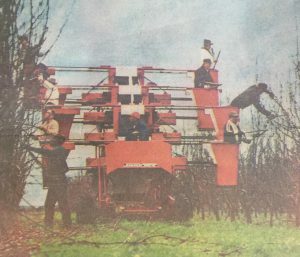 The Learys tried harder than most growers he knows to mechanise the pruning and harvesting process. They worked with UC Davis to develop harvesting and pruning machines. However, old pear orchards weren’t planted with machines in mind and new equipment and operational labor costs were high. Eventually these efforts would not prove to be worth their cost. Dennis still believes there is a place for mechanization in the future if new orchards are planted with this intention. Dennis also sees opportunities for the California pear industry, particularly with processed pears, in the foodservice industry. While Dennis has witnessed a great deal of change in California pear farming over the decades, some things always remain true. As his father once told him, it doesn’t matter what type of business you are running, it’s important to line up the basics and plan ahead. This advice has brought Dennis much success during his time managing and carrying on the family business and legacy.